Gender equality has been a prominent topic of conversation in recent weeks. Australian Prime Minister Malcolm Turnbull’s decision to appoint three new female ministers to his cabinet last month highlighted the disparity between genders in Australian politics. While these appointments were a step in the right direction, the fact that the resulting ratio of women to men was just one to four showed there is still a long way to go. McKinsey Global Institute’s gender parity dashboard further highlights this alarming issue. 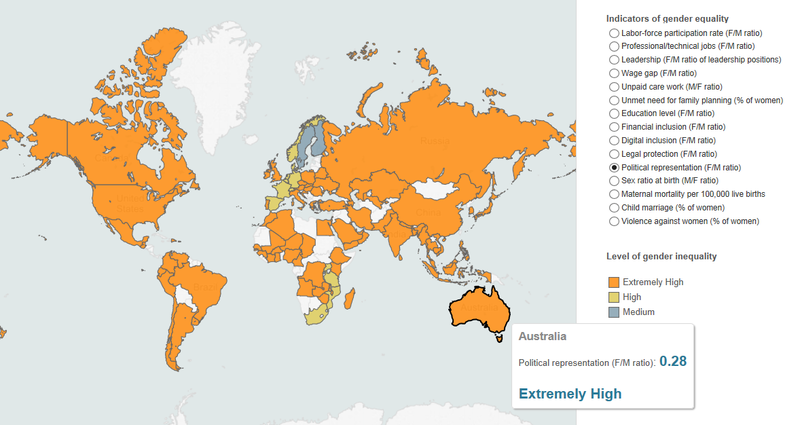 The rate of gender inequality in political representation in Australia and throughout the world is extremely high. Australia’s results in leadership (high), wage gap (high), and violence against women (high) — to name a few — are similarly concerning. As a society, we need to do more. Gender equality is more than just a moral imperative — it’s a business imperative. Gender equality in the workforce is proven to deliver significant benefits. For society, those benefits include advancing development and reducing poverty. For business, they include better financial performance, improved corporate image and reputation, enhanced employee retention, and greater innovation. At Rowland, we understand the importance of gender equality and enjoy the benefits of having a diverse workforce. We are also proud to work with our clients to promote this important topic. In 2013, we proudly supported the launch of Queensland Male Champions of Change (QMCC) — a collective of senior male executives taking a stand for gender equality. Their vision is to ensure there are opportunities for men and women to develop their careers at an equal rate. They are especially committed to trying to influence, leverage, and grow the talent of women in areas of work or industries where women are currently underrepresented or underutilised. We worked with QMCC to produce a launch video and an original publication outlining how member organisations are ‘getting in the game’. If you’d like to learn about how you can advance gender equality within your organisation, visit the QMCC website at: www.qldmcc.org. For information about Rowland’s video production services, please contact our Multimedia Director, Nick Wolff, on 07 3229 4499 or nick.wolff@rowland.com.au.